Ford Motor Co. is launching a new advertising campaign for its Expedition SUV as it prepares to add workers and increase production at the Kentucky plant where it's built. The automaker in November said it would move 550 workers from the Louisville Assembly Plant, which makes the Ford Escape and Lincoln MKC crossovers, to instead make Expeditions and Lincoln Navigators at the nearby Kentucky Truck Plant, as well as Super Duty pickups. The shift, scheduled to happen in July, will allow production to rise 20 percent, Ford said, the second such increase since the redesigned SUVs went on sale in late 2017. "There was a [25 percent] increase last year, and it stocked the shelves and got us to an inventory situation that we were comfortable with," Matt VanDyke, Ford's director of U.S. marketing, told reporters Monday. "What we want to do is stoke the demand. We'll start the advertising, but it doesn't impact the showroom the next day. We feel like we can increase our share of market interest, and that will impact the second half of the year right as we ramp up." The new marketing push uses the slogan "Better Big." 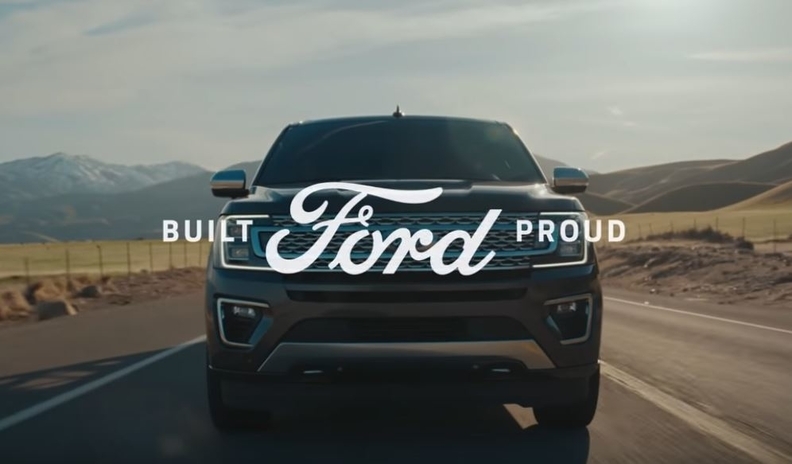 Developed by the firm Wieden+Kennedy, the ads are an extension of the automaker's "Built Ford Proud" campaign and highlights attributes such as the vehicle's seating capacity, sunroof and towing capabilities. Ford will show the commercials during this week's NCAA men's basketball tournament games, among other nationally televised events. Actor Bryan Cranston narrates the spots. Ford's decision to redesign the Expedition for the first time in two decades is paying dividends. Retail sales soared 35 percent last year, average transaction prices rose $11,700 to $62,700 per vehicle, and Ford increased its share of the segment by 5.6 percentage points, mostly due to conquests from GMC and Chevrolet, Ford said. Expedition sales rose 61 percent in the first two months of the year, according to the Automotive News Data Center. The automaker's Kentucky Truck Plant already operates at 102 percent capacity, according to LMC Automotive. Last year, it produced 75,826 Expeditions, a 52 percent increase, according to Ford. Navigator production more than doubled to 24,537. Ford aims to squeeze out 20 percent more vehicles this year thanks to increased line speed and innovations it began to implement in 2018. Ford added a door line last year, part of a $25 million investment, that allows workers to remove the doors on the body of the vehicle and reattach them later so they have easier access to the interior, which saves time. In addition, Ford added platforms and pits to certain work stations to allow workers on multiple levels to access the vehicle at the same time.